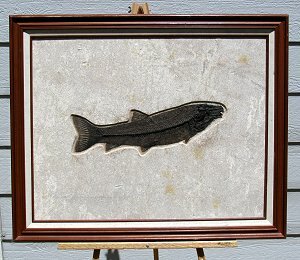 Size: Fish is 19.5", frame is 27" X 33"
This is a beautiful specimen of a rare type of fossil fish. It is a huge Notogoneus osculus from the Green River Formation of Wyoming. Notogoneus was a saprophage, using its vacuum-like mouth to feed from the river and lake bottoms. This ''sucker'' fish probably lived in lake tributaries and rarely ventured into lakes. This is thought to be why Notogoneus are rare finds in the Green River (Fossil Lake) Formation. This huge specimen (almost 19 inches!) is complete and has all of its fins and tail rays intact (rare!). The fish displays the detailed body, long backbone, and sucker mouth extremely well. The fossil is aesthetically centered on the rectangular plate of stone matrix. And this impressive fossil has been professionally framed for optimal display. 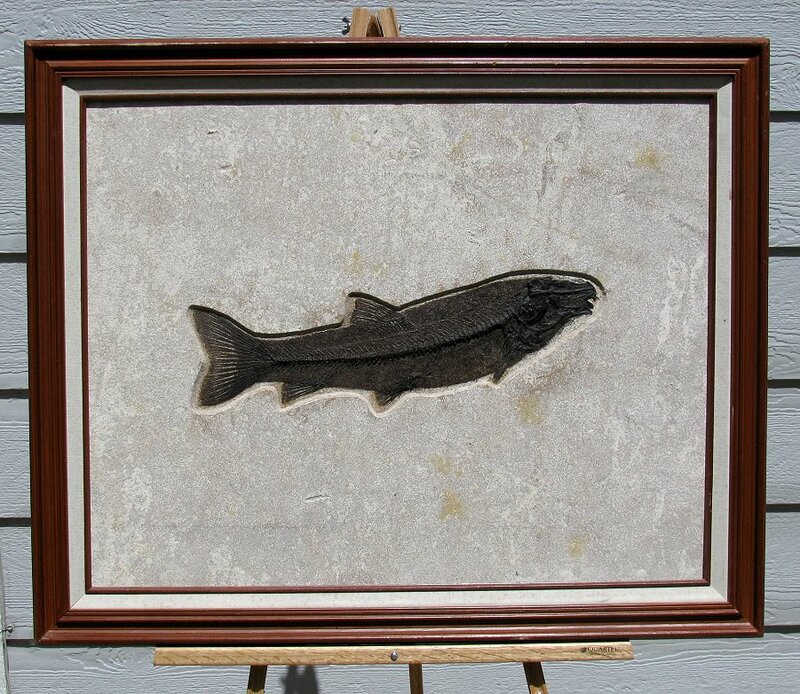 This is a museum quality example of one of the most uncommon and unusual fossil fish found in Wyoming - easily the best one we've ever seen.